Black and white negative of a photograph showing an image of the residence of Andrew M. Ross. The house was located at 401 Colborne Street West. The Ross family is standing on the porch. From left to right: Unidentified, Andrew Ross, Mrs. Ross, Marcia Ross. 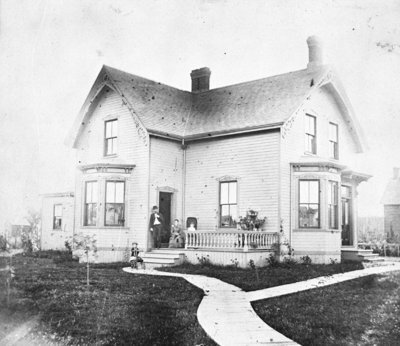 This frame house was built in 1879 by Andrew Ross (1851-1936) at the south west corner of King Street and Colbeorne Street at 401 Colborne Street West. Ross was a dry goods merchant in Whitby and a former Mayor of the Town. His daughter, Miss Marcia Ross (1889-1979) was the last of the family to live in this house. Residence of Andrew M. Ross, c.1890, unknown photographer, Whitby Archives, 17-018-001.